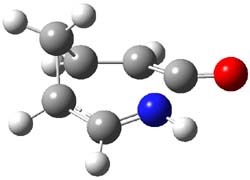 Duncan has discovered a pseudopericyclic [3,3]-sigmatropic rearrangement, 1 and what is particularly interesting is how rare this seems to be! (See this post for an earlier related study.) Using CASSCF/6-31G* computations of Reactions 1-9, only Reaction 1 is found to be pseudopericyclic. (The transition state for this reaction is shown in Figure 1). This characterization is based largely on the shapes of the active MOs, one of which displays two orbital disconnections. In addition, this transition state is much more planar than is typical for a [3,3]-rearrangement. Dihedral angles are about 20 ° in the TS for reaction 1, while in the other reaction TSs, their dihedral angless are about 50 ° or even larger. This is consistent with Birney’s contention that pseudopericyclic reactions have nearly planar TSs. The activation barrier for Reaction 1 is also quite small, 19.4 kcal mol-1, much lower than for Reactions 2 (26.2 kcal mol-1) and 3 (33.1 kcal mol-1). Figure 1. CASSCF/6-31G* optimized TS for Reaction 1. Not particularly strong programming at the year’s spring ACS meeting – but one great session in the organic division yesterday. This was the awards session in honor of John Baldwin getting the James Flack Norris Award for physical organic chemistry. First to speak was James Duncan, who discussed his recent CASSCF computations looking for pseudopericylic [3,3]-sigmatropic migrations. I will be commenting on his latest work in a post that will appear soon. I had to skip the next talk, but came back to hear John Brauman discuss recent work on the solvation effect in the SN2 reaction. This is an interesting case of where the screening of larger substituents is counterbalanced by geometric changes that lead to greater charge distribution. The net effect is that they cancel each other out, and the methyl,ethyl, iso-propyl, butyl β-effect is negligible. Next was Peter Schreiner who discussed his carbene work, specifically the enormous tunneling effect observed in hydroxymethylene (see this post). He discussed some new work, that is if anything even more fantastic on methylhydroxycarbene – look for this work perhaps later in 2011. Last to speak was John Baldwin – and he described his truly tour de force efforts in examining the [1,3]-rearrangements of vinylcyclopropane and vinylcyclobutane. The former work is described in my book, while the later study is still ongoing. John’s work is amazingly painstaking and careful. I am truly in awe of his dedication in taking on extremely difficult studies that require enormous care. John has really taught us a lot – not just about these rearrangements (they involve diradicals on a flat plateau demanding dynamic analysis – but how to think about a study and then carry it out to fruition so that all details are assessed. A truly deserving recipient! I concluded the subchapter on pseudopericyclic reaction (Chapter 3.4) with a discussion of the controversy concerning the nature of the electrocyclization of 7-azahepta-1,2,4,6-tetraene 1. Quickly summarizing form the book, based on which data one deems important, the reaction can be seen as either pericyclic or pseudopericyclic. However, I offered David Birney’s opinion as perhaps the proper way to interpret this reaction. David suggested that the TS has both pericyclic and pseudopericyclic character. I wrote that “what we have is a continuum from pericyclic to pseudopericyclic character, analogous to the SN1 to SN2 continuum for nucleophilic substitution”. Duncan has revisited this reaction,1 employing both B3LYP and CASSCF(10,9) computations. He concludes that the reaction is “neither purely pericyclic nor pseudopericyclic” – just as Birney had indicated. Duncan does offer the possibility of a secondary orbital interaction involving the nitrogen lone pair. But it is nice to see confirmation of the interpretation that David originated for my book! (1) Duncan, J. A.; Calkins, D. E. G.; Chavarha, M., "Secondary Orbital Effect in the Electrocyclic Ring Closure of 7-Azahepta-1,2,4,6-tetraene – A CASSCF Molecular Orbital Study,", J. Am. Chem. Soc., 2008, 130, 6740-6748, DOI: 10.1021/ja074402j. 2 does not exist as a local minimum on the B3LYP/6-31G(d,p) or G3MP2B3 surfaces; rather all optimizations collapse to 3. However, when optimized with PCM with the dielectric of DMSO, 2 is a local minimum. The transition state for loss of CO from 1 leads directly to 3. This TS (TS1-3, see Figure 1) is non-planar, unlike for the analogous reaction of the furandione. TS1-3 does not correspond with a pseudopericyclic reaction. The transition state for the dimerization of 3 (TS3-4), also shown in Figure 1, appears to be a [2σs + σs] cyclization, which is thermally forbidden. However, analysis of the molecular orbitals indicates the interaction of sets of orthogonal orbitals, exemplary of a pseudopericyclic reaction. The barrier for this reaction, 17.9 kcal mol-1, is consistent with an allowed pseudopericyclic process. (1) Sadasivam, D. V.; Birney, D. M., "A Computational Study of the Formation and Dimerization of Benzothiet-2-one," Org. Lett., 2008, 10, 245-248, DOI: 10.1021/ol702628v. (2) Wentrup, C.; Bender, H.; Gross, G., "Benzothiet-2-ones: Synthesis, Reactions, and Comparison with Benzoxet-2-ones and Benzazetin-2-ones," J. Org. Chem., 1987, 52, 3838-3847, DOI: 10.1021/jo00226a022.